By Neate Sagar, Buzzing the Net – Everything is a test at Team Canada’s evaluation camp, so it’s hard to tell if one shift might have more weight. Yet, at least in Saturday’s 3-0 exhibition-game win over the CIS Toronto Selects, one big takeaway was the opening shift of the third period from the Frédérik Gauthier-Kerby Rychel-Josh Anderson line, when it scored the second goal. Each member of that trio needed to have a strong afternoon to stay in the mix for spots on Brent Sutter’s final 22-man roster. Rychel gave a strong indication that he might be able to go from goal scoring to grinding, getting the primary assists on each of the first two goals. 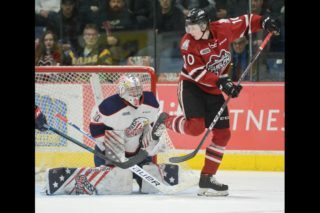 That came as little surprise to people who have watched the Columbus Blue Jackets first-rounder across his four seasons in the OHL, where Rychel has posted two 40-goal seasons while playing with some of the edge his father, Windsor Spitfires GM Warren Rychel, had over his long career. On that second goal, Rychel chipped and chased to set up a cycle in the CIS Selects’ zone. A well-considered pinch by Aaron Ekblad sustained the pressure. That led to a Blue Jacket pick-to-Blue Jacket pick, with Rychel teeing up Anderson for a top-shelf shot by Troy Passingham (who earned a Memorial Cup ring on the Warren Rychel-assembled 2010 Spitfires).